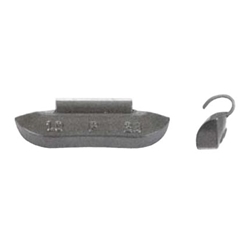 P Type Lead Clip-on Wheel Weight Coated 3-1/4 oz BOWES WW P325 Box of 25. The P-Series lead clip-on wheel weight is used on standard passenger car 13”–17” steel wheels. Also available in coated (PS-Series). Please refer to Application Guide (Part # 18082) and use rim gauge (RGP1) to verify specific applications. Note: Use our XT-Series clip-on wheel weights for thinner high-strength steel wheels and our TN-Series clip-on wheel weights for late-model, light-trucks with steel wheels.